When the sacristan came to close the church of Saint-Pierre in Montluçon on the evening of April 9th, he discovered that the tabernacle had been broken open and the ciborium containing consecrated hosts had been stolen. Monsignor Laurent Percerou, Bishop of Moulins said "This act, which touches us in the heart of our faith, is a terrible and dramatic act." 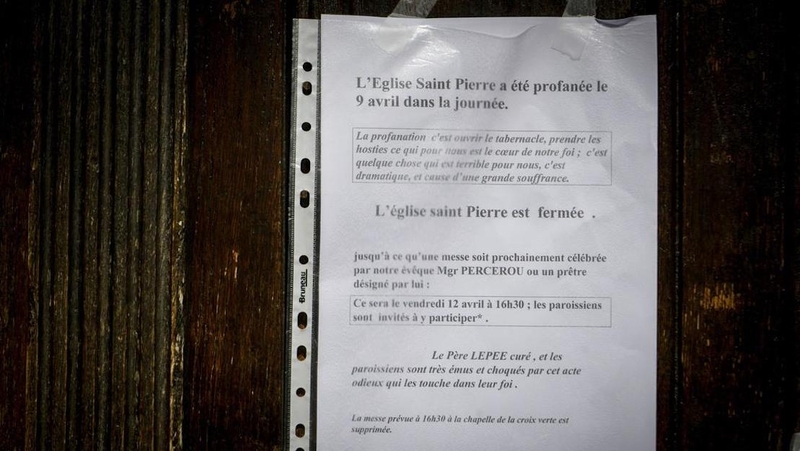 The parish priest Father Gilbert Lépée said "It's something extremely disturbing that shocks us all." After the sacristan discovered the theft, more members of the parish were called to the church along with the police. Forensic investigators gathered evidence at the scene. Monsignor Percerou said in an official statement "I would like to repeat to the faithful and the inhabitants of the parish of Sainte-Marie that I share their grief and indignation and that I pray for them." Due to the desecration of the consecrated hosts, the church was closed until a reparation Mass could be held on April 12th. Father Lépée explained "We believe that Jesus wanted to stay with us in the very mysterious form which is bread. I am convinced that by this sacrilege, it is Jesus who is being scorned." He appealed to the thief to return the hosts because for the faithful, they are the items with the greatest value.